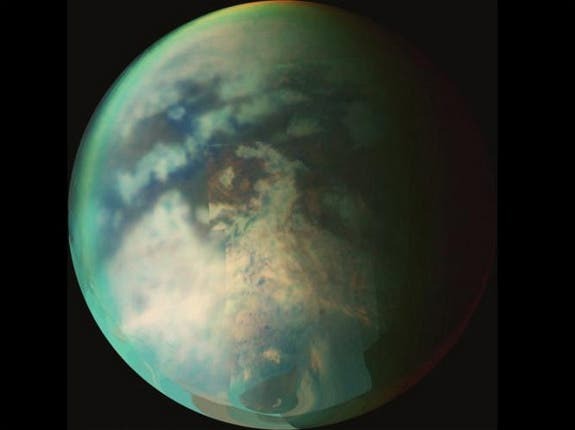 "There are still a lot of mysteries about Titan, said University of Washington astronomer Benjamin Charnay We still don't know how a thick nitrogen atmosphere formed, where the methane comes from nor how Titan's sand forms. And it is not completely excluded that life can be there, perhaps in its methane seas or lakes. So Titan really is a fascinating and evolving world, which has to be understood as a whole." Titan, discovered in 1655 by Christian Huygens, has long intrigued astronomers. Its atmosphere is 98.4 percent nitrogen and most of the rest is methane, and a bit of hydrogen. Its gravity is one-sixth that of Earth's and its air density is four- to five-times higher, meaning that flight will be relatively easy for visiting spacecraft. The European Space Agency's Huygens probe, which rode along on Cassini, successfully landed on Titan in 2005 and sent back the first photo of the moon's stone-strewn surface. With its thick, hazy atmosphere and surface rivers, mountains, lakes and dunes, Titan, Saturn's largest moon, is one of the most Earthlike places in the solar system. As the Cassini-Huygens spacecraft examines Titan over many years, its discoveries bring new mysteries. One of those involves the seemingly wind-created sand dunes spotted by Cassini near the moon's equator, and the contrary winds just above. Here's the problem: Climate simulations indicate that Titan's near-surface winds — like Earth's trade winds — blow toward the west. So why do the surface dunes, reaching a hundred yards high and many miles long, point to the east? The direction of the dunes has at times been attributed to the effects of Saturn's gravitational tides or various land features or wind dynamics, but none quite explained their eastward slant. Violent methane storms high in Titan's dense atmosphere, where winds do blow toward the east, might be the answer, according to new research by Charnay and co-authors in a paper published today in the journal Nature Geoscience. Using computer models, Charnay, a UW post-doctoral researcher, and co-authors hypothesize that the attitude of Titan's sand dunes results from rare methane storms that produce eastward gusts much stronger than the usual westward surface winds. "These fast eastward gusts dominate the sand transport, and thus dunes propagate eastward," Charnay said. The storm winds reach up to 10 meters a second (22 mph), about 10 times faster than Titan's gentler near-surface winds. And though the storms happen only when Titan is in equinox and its days and nights are of equal length — about every 14.75 years — they are of sufficient power to realign Titan's dunes. Titan was last in equinox in August 2009. It probably helps that, according to Cassini's observations, Titan's atmosphere is in "super-rotation" above about 5 miles, meaning that it rotates a lot faster than the surface itself. Their model, Charnay said, suggests that these methane storms "produce strong downdrafts, flowing eastward when they reach the surface," thus rearranging the dunes. Charnay said he tried first, without success, to solve the problem with a global climate model that didn't factor in methane clouds, then realized that it was impossible, hinting that methane could be part of the solution. "It was a kind of detective game, as often is the case in planetary sciences, where we have many mysteries and a few clues to solve them," he said. The dunes in question, which are linear and run parallel to Titan's equator, are probably not composed of silicates like Earth sand, Charnay said, but of hydrocarbon polymers — a kind of soot resulting from the decomposition of methane in the atmosphere. Charnay noted a December study reported in Nature showing that it would take winds of at least 3.2 mph to lift and transport sand across Titan's surface — that's 40 percent to 50 percent stronger wind than previous estimates. The measurement of such a high wind speed threshold was a pleasant surprise, Charnay said: "That means that only fast winds transport Titan's sand, compatible with our hypothesis of strong storm gusts controlling the orientation and propagation of dunes." Charnay said direct observation by Cassini would be the way to confirm his hypothesis. Unfortunately, the Cassini mission will end in 2017 and Titan's next equinox is not until 2023. "But there will be other missions," he said.